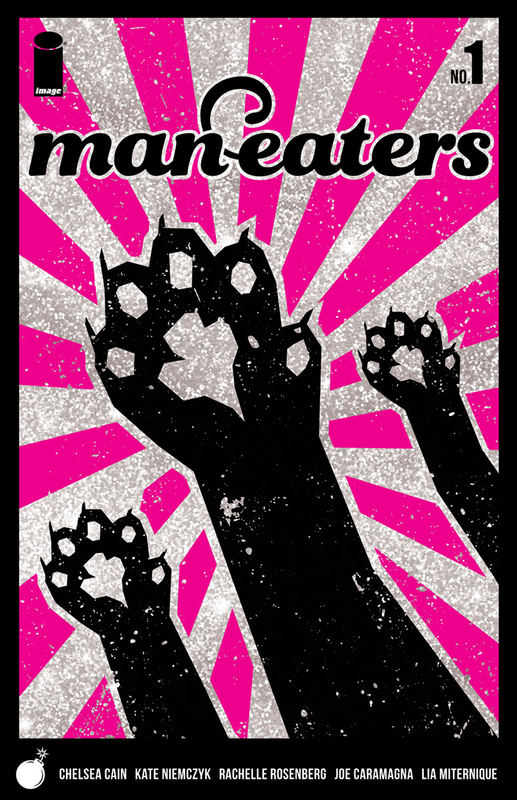 Posted on August 4, 2016 by thelostlighthouse	in Comics, Literature and tagged comics, comics reviews, Ed Brubaker, Elizabeth Breitweiser, Image, Image comics, Kill or be Killed, Literature, modern comics, Sean Phillips, The Fade Out, The Lost Lighthouse, TLL. It’s rare to have so much trust in a creative team in comics, that when I hear they have a new book coming out I don’t have to look into what it is or what its about. At the very least, I’ll check out the first issue and will almost certainly be back for more. Ed Brubaker, Sean Phillips and Elizabeth Breitweiser are such a team, with Brubaker and Phillips’s previous collaborations Criminal, Fatale and The Fade Out (Breitweiser joined them as colorist on the latter) all receiving critically acclaim. The Fade Out (the first issue of which I reviewed a while back) was deservedly given the Eisner Award for Best Limited Series this year, as well as a place on the far less prestigious ‘Adam’s Top 5 Comics of 2015‘. 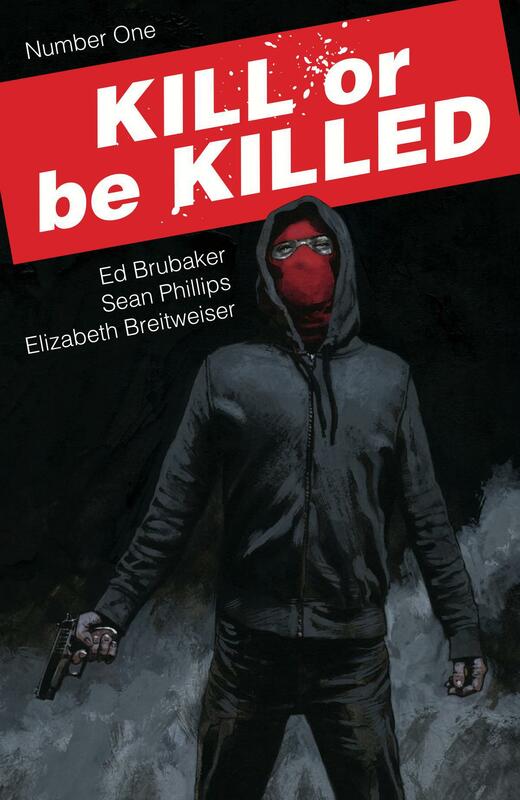 So with all that in mind, Kill or be Killed #1 (written by Brubaker, drawn by Phillips and coloured by Breitweiser, published by Image Comics) was a must-buy this week. As with The Fade Out, this first issue also comes with a short piece from Devin Faraci on cinema, this time on Death Wish and what it said about 1970’s America, and is as interesting a read as his pieces on 1940’s Hollywood. That on top of a 34 page comic is a pretty good deal. Kill or be Killed opens with a healthy dose of violence, with a masked and hooded man making his way through a building ruthlessly killing several men with a shotgun. The attacks take on the air of pitiless executions, while the book’s protagonist narrates over the killings calmly, reflecting on how he came to be doing this – murdering ‘bad people’ who deserve it. It’s an in media res opening that, after our masked man Dylan brutally finishes off his last target, winds back to his previous life. The narration moves on, somewhat haphazardly as Dylan tries to bring context to the reader, going from an early instance of feeling weak when a girlfriend is catcalled, to his recent suicide attempt. Clearly, Dylan isn’t happy. His roommate is dating his best friend Kira, whom he is predictably also in love with, complicating and suffocating his home life. But the worst thing, and what drives him to a rooftop, is their pity amidst his loneliness. However, between this failed suicide attempt and the opening scene, Dylan gets back the “joy of being motherfucking alive”… and then his life changes dramatically, and the 28-year-old grad student becomes a man who needs to kill, however he justifies it in his head. I went into Kill or be Killed knowing little else past the title and the team behind it, and if I’ve been particularly vague in my summary it’s because I think that is the best way to approach the story. The trigger point for why Dylan starts to kill was unexpected and deftly handled, and I think more satisfying with no prior knowledge. Rest assured, it is good. 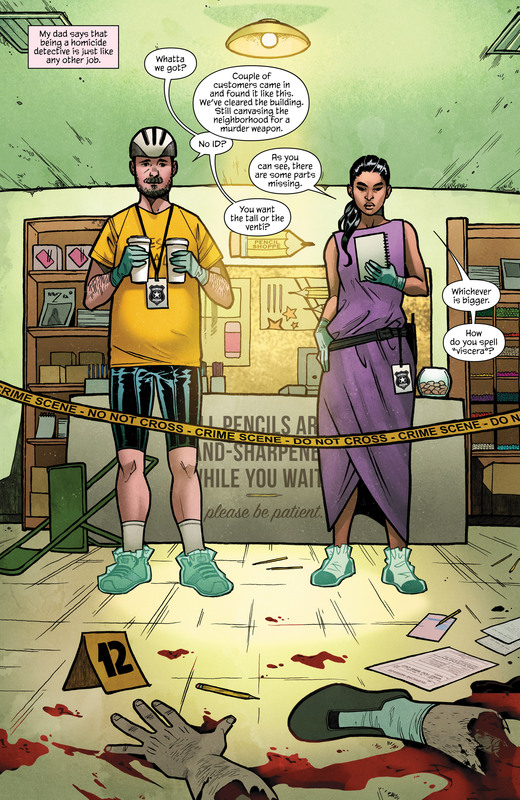 And as for the rest of the story, Brubaker’s talent for intrigue and character study are on full display, while delivering a script and plot that only replicates the level of quality of his previous work while simultaneously doing something entirely new. It is definitively modern, with Dylan talking about how “Cops kill innocent black kids and get away with it…” and “Psychopaths run for President…” as examples pulled straight from the headlines to illustrate how messed up the world is right now. But how that justifies his actions, or at least how he thinks it does (and we don’t know why the men he is killing are bad, all we have is his word), opens up a fascinating look into the morality of the vigilante killer, rendering Kill or be Killed as much more than a simple take on The Punisher for example. All said, this is very strong start to what promises to be an intriguing story. As for the art, if Phillips and Breitweiser were producing stunning work on The Fade Out (they were), then this is some next level excellence. The book is full of heavy shadows, marrying subdued art up perfectly with the tone of the story. The action at the start is exhilarating and affectingly violent, while the facial detail throughout is gorgeous. The level of detail in the backgrounds too is incredibly high, in particular the snowbound city towards the end of the issue. But the more chilling elements of the book, and the catalyst for Dylan’s new life, is where I found the book to excel. There is a lot to be said of the layout of the art too, with panels framed in such a way as to enhance the fact that this is being narrated by the main character, and he is the focus. 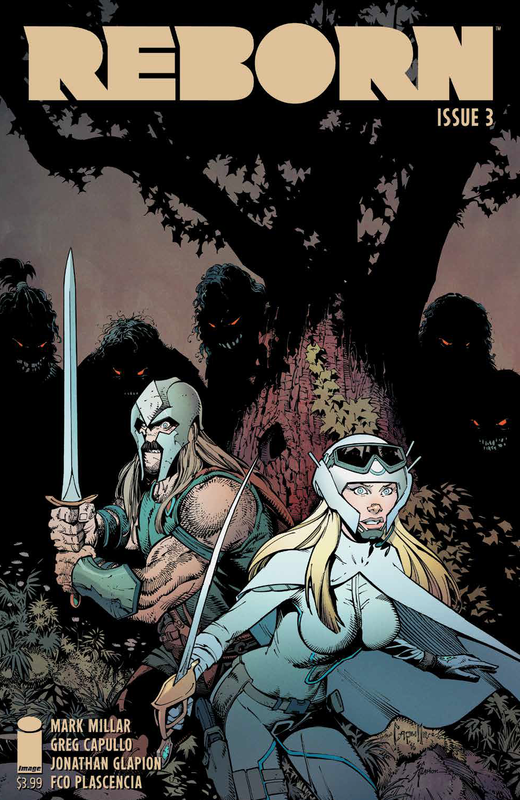 Breitweiser compliments and brings out the best in Phillips’ work, with an array of different palettes and tones through each scene, none of which are a jarring change from the last. 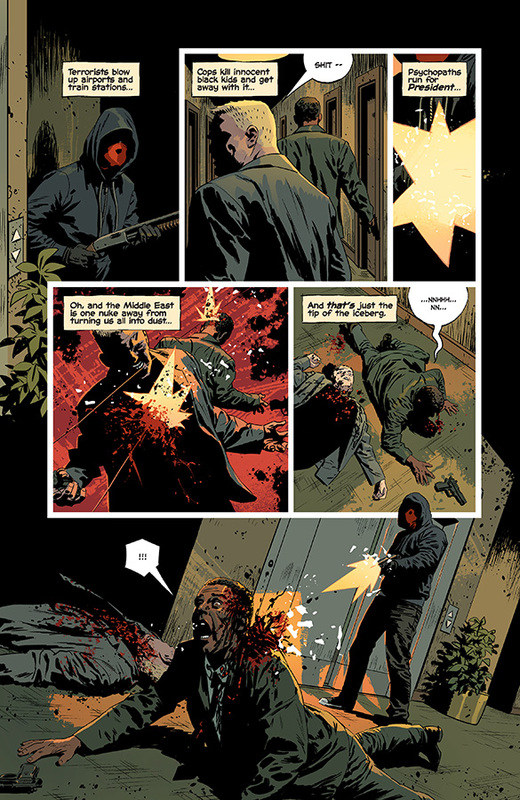 From the opening action and the dominance of the reds of Dylan’s mask and the blood spatters, to the oppressive clinical glare of a hospital waiting room or the unclean tones of a city bus and the city lights outside it, all the colour work blends in with the shadowy aesthetics of the book for a result that simply is the best modern comics can look. It’s rare to have so much trust in a creative team in comics that you pick up a new book without looking into it at all. It is even rarer for that book to be even better than you expected from them. This is comic books at their best. 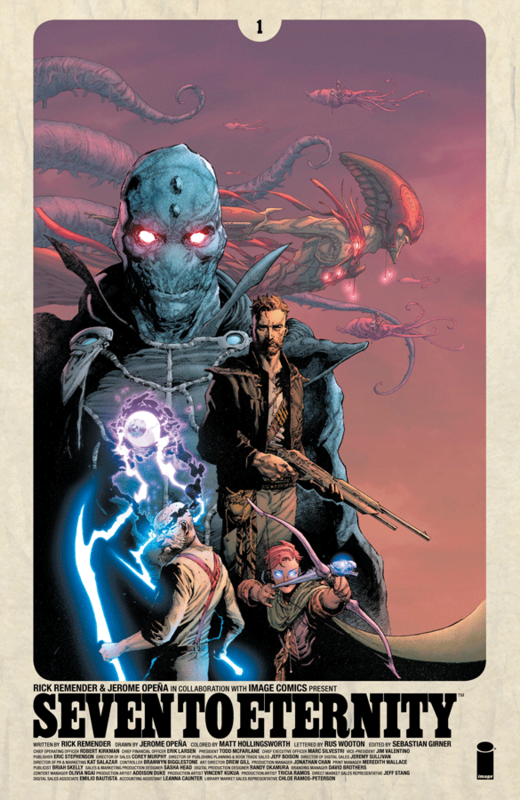 Check it out at your local comic shop or digitally now. 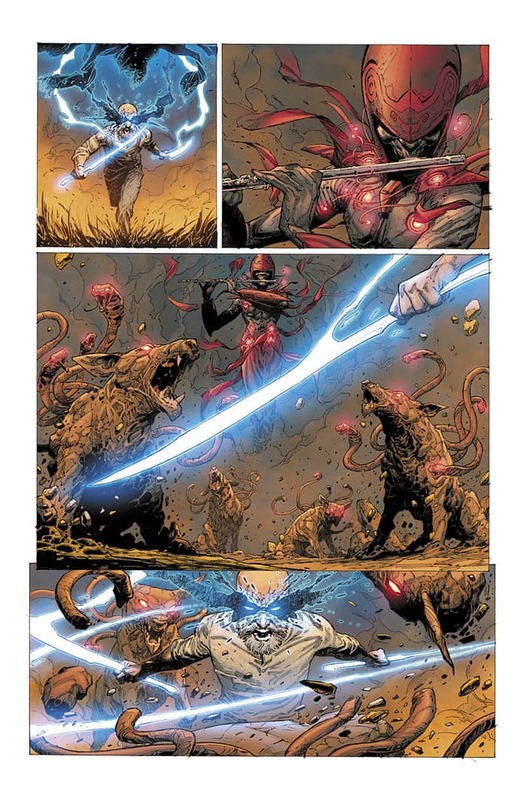 Posted on May 12, 2016 by thelostlighthouse	in Comics, Literature and tagged Adriano Lucas, Andrei Bressan, Birthright, comics, comics reviews, fantasy, Image, Image comics, Joshua Williamson, Literature, The Lost Lighthouse, TLL. Warning: Minor spoilers. Especially as I’ll be reviewing a whole volume, you’ll probably know most of the plot of the first issue by the time you finish. But go and buy it anyway (implied spoiler about the score I give it)! A couple of months ago I made a huge mistake. I went into Excelsior! Comics in Bristol and asked them for a recommendation. 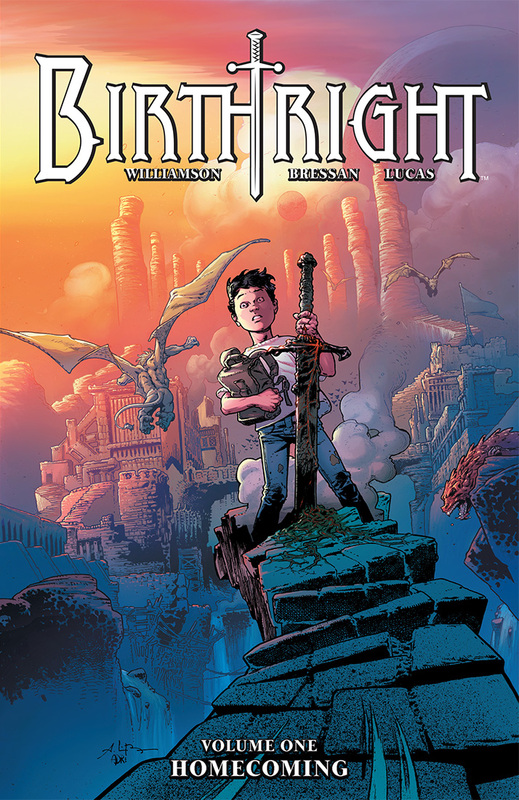 I was told I had to read Birthright written by Joshua Williamson, with art by Andrei Bressan and Adriano Lucas. You know what? They were completely, 100% right. I’m hooked on it and need to pick up another volume as soon as I can. Now let me tell you why it’s good. Our hero is a boy and later a man called Mikey. As a kid he had a loving, tight knit family, with caring parents and was best friends with his brother. He goes out for a game of catch with his dad, but the ball goes astray, he chases after it but finds himself in the fantasy world of Terrenos, full of dragons, kingdoms and of course an evil God King called Lore, and yes, he’s the chosen one. Destined to save the world and defeat the evil king. Meanwhile his family search desperately for him but come up blank, eventually the police get involved and the dad is bought into custody, after all he was the last person to see Mikey. A few years later Mikey has returned to the world, while his older brother is still in school but getting into fights, his parents are divorced and hate each other and his dad a raging alcoholic, Mikey is a fully grown man built to make Arnold Schwarzenegger look tiny and with an arsenal of magical weapons and items that would make any Dungeons & Dragons party cry. He has returned from the world of Terrenos to save our world from a great evil. The story then hops backwards and forwards between the current time in our world and Mikey’s time in Terrenos, showing us what happened to him while he was there and how he grew up in another world. As a world Terrenos is full of wonderful magic, creatures and peoples. The characters there are full of personality and you’re left wanting to know so much more about it. I’ll leave it there. There’s more involved, fantastic plot twists and a wonderfully gripping story. Mikey is unsurprisingly treated as a mad man and has such a battle convincing his family he is who he says he is. 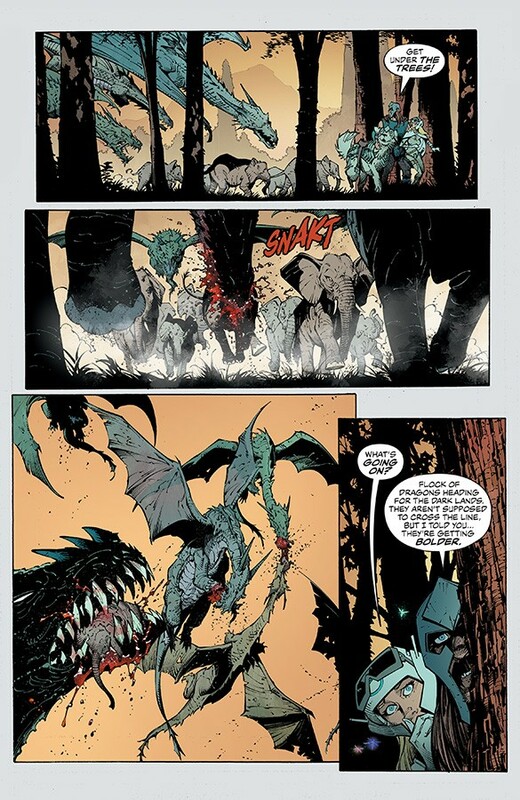 As well as that the art is incredible, the action scenes are full of the fantastical colour you’d hope for from fantasy combat and both worlds have the perfect feel to them. There’s only so much I can say about it, but the art is absolutely one of the strongest points of this comic. This is one of my new favourites. If you like comics and fantasy then you need to try this. It isn’t quite the perfect fairy tale story some of these turn out to be either. Final Score – 9.25 Flaming Swords out of 10!